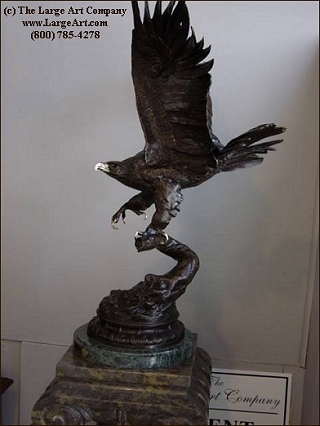 A beautiful wildlife sculpture of the American Eagle recreated from the original sculpture completed by Jules Moigniez (France) in the late 1800's. This sculpture is cast using the "lost wax" bronze casting method and made from high-quality American bronze. The patina is a traditional chocolate brown and the beak and talons are done in a highly-polished gold. This piece captures the graceful landing of an eagle on a branch. The detail of this sculpture is phenomenal! You can see each and every feather on this awesome bird. The sharp beak and talons are cast with a gold patina and add the perfect highlight. Even the artists signature is reproduced in the base. This would make an excellent gift! If you would prefer to have the beak and talons also in brown, just ask; we are happy to cast it that way for you. This Eagle statue is available in the original size as well as a smaller version for more limited spaces. However, if you can afford it I recommend the 32" size as it is truly amazing. Original Size - 32" tall x 20" wide.